In front of Star Solaris I have a flower bed. It wasn't always a flower bed... It started out as a "I have random things to plant and this looks like a good spot" bed... Which is how the parsley ended up there. Originally, I had this romantic idea of growing herbs in my kitchen window. The parsley wasn't too happy there and insisted that I move it outdoors. When my research revealed that the Romans believed growing parsley in the home invites death, I'm thankful that I listened. Not only did it recover quickly from being transplanted, but it took off fast! Quickly consuming a rather large section of the bed. When I decided to dedicate the bed to flowers, I just left the parsley to do its thing. It grew SO big I finally decided that today was the day that I would cut it back. With about 30 minutes before my next client was due to arrive, I got the scissors and set to trimming it along its base. Placing it in bundles, planning to tie them with hemp and hang the bundles to dry. While doing so, I'm munching on the leaves thinking about how the Romans used it for a breath freshener. "My breath will be nice when my client gets here." Then I went around insisting that my kids each eat a leaf. Sweet kids I have. 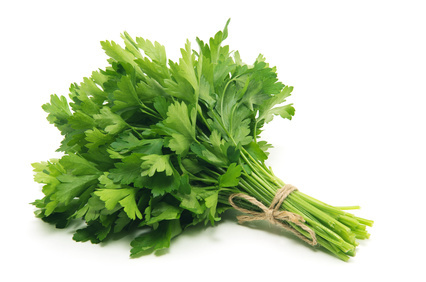 Parsley has more vitamin C then an Orange. It's good for them I told them. After having hung the bunches along my curtain rod (where else was I gonna hang them?) I set to prepare for my client. She arrives. Tall, beautiful, young. Open minded but not super familiar with all things Woo. She was here for one of my Intuitive Life Path Readings. I felt inclined to burn some sweet grass upon her arrival which usually means there's a guide of an ancestor (aka family member on the other side) that is wanting to make an appearance. Which is exactly what happened. It was her grandfather. He clearly showed himself and his physical appearance. Shared his excitement with her over having his dog (also deceased) by his side. After a clear and flowing conversation with him, I was able to share with her all the things he wanted her to know and proceed to give her reading with the cards. I was feeling quite proud of myself for having communicated so seamlessly with her grandfather. Often, it's a little effort to tune in and hold on to the signal. This time was as easy as could be. After she left it was time for me to get back to my parsley project! "I have all this wonderful parsley! I need to research what it's magical properties are!" Lo and behold, what's one of the first things I read? "Helps communication with spirits of the deceased." 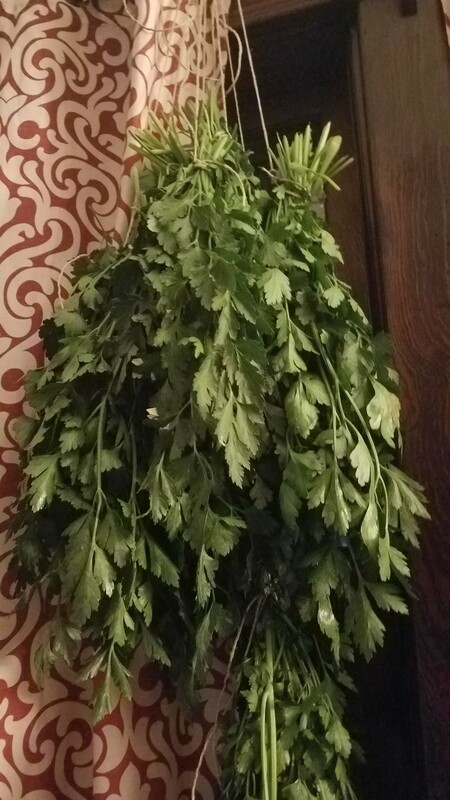 How synchronistic that I felt compelled to trim my parsley, eat a sprig, and hang it all up in my house... Right before a client arrives who's grampa is eager to say hello. Was it him who was nudging me toward the parsley? I will personally attest to that which is written about parsley. It most certainly DOES help communication with spirit. All plants have their own energy within them. Gifts to offer. There are many ways to release the energy they carry. Tea. Incense. Oils. Essences. Gifts and blessings from the nature kingdom are always ready and waiting to be rediscovered by those who are open. Upon further study, I learned a little more interesting lore about parsley. Parsley is also considered sacred to Persephone (the archetype of which has been a theme for me lately) as she is said to have returned from the underworld bearing a sprig. Okay, so... That ties in to its gift in assisting communication with the other side. A few other things it's said to be good for? I'll be testing it out! Light Love and Blessings to You!